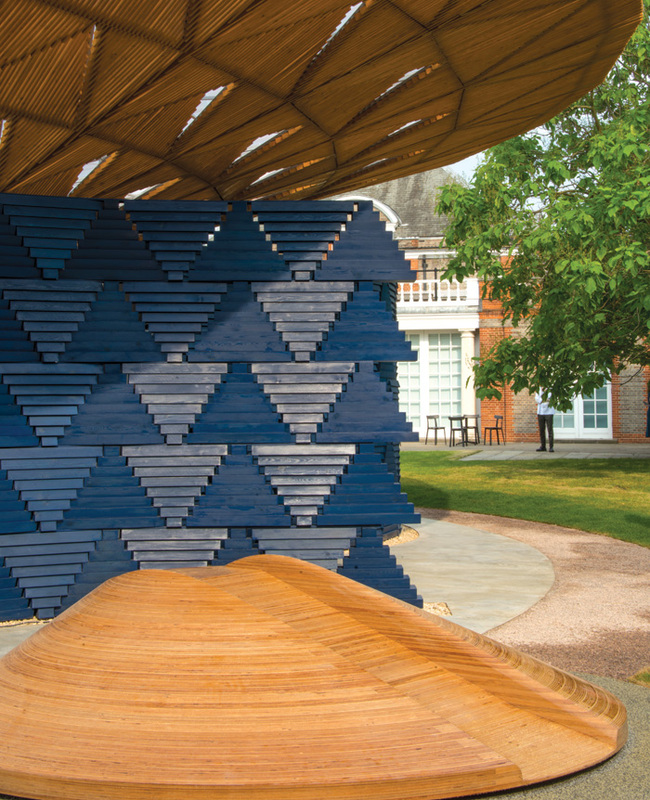 A sweeping, wooden canopy landed, much like a stray frisbee might, on the lawn of the Serpentine Galleries this summer within the lush greenery of London’s Kensington Gardens. Its complex steel framework is concealed from view, encircled by a deep-indigo-blue curved wall, so that the disc-shaped roof appears to hover amid the treetops. The blue enclosure bends and kinks apart to invite you to find a pathway into this open-armed shelter in the middle of the park. 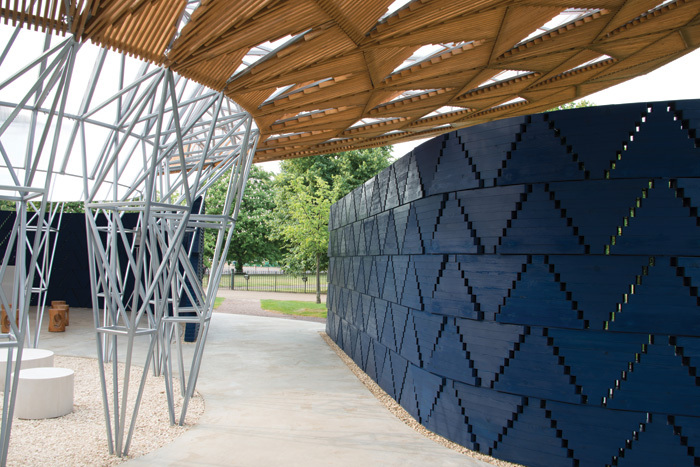 Inspired by the form of a tree in the landscape, a central meeting point for people to convene in his home village of Gando in Burkina Faso, Diébédo Francis Kéré’s Serpentine Pavilion seeks to create a place where people can gather and connect with nature. The structure has a lightness and permeability that gives it a sense of openness, both to people and its surroundings. 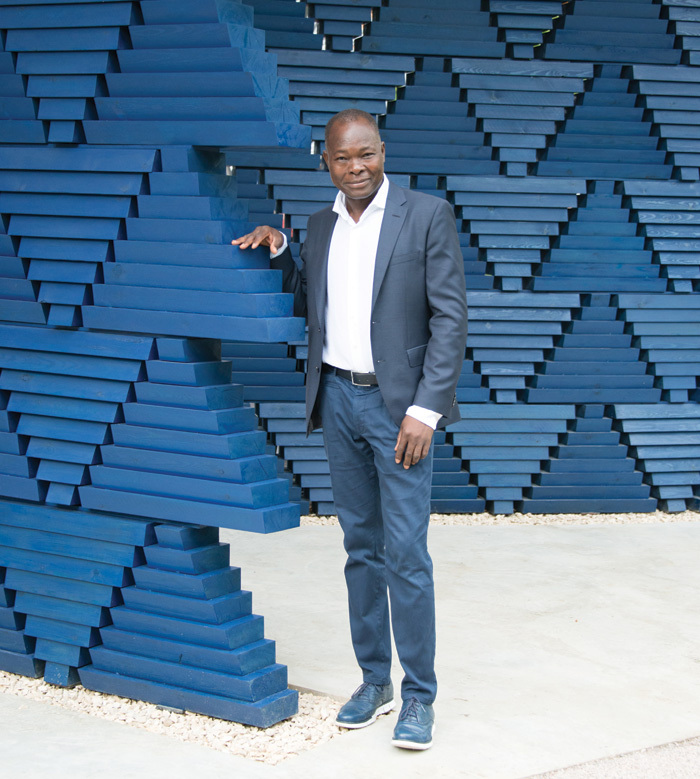 Kéré is the 17th architect to be invited by the Serpentine Galleries to design a temporary pavilion for the world renowned, annual commission, following on from BIG’s giant pixelated wall last year and SelgasCano’s playful, plastic caterpillar the year before. The brief is simple: to design a 300 sq m pavilion that can be used as a cafe and meeting place during the day and a space for events, talks and entertainment by night. There is no budget: it is realised through sponsorship and sale of the pavilion. 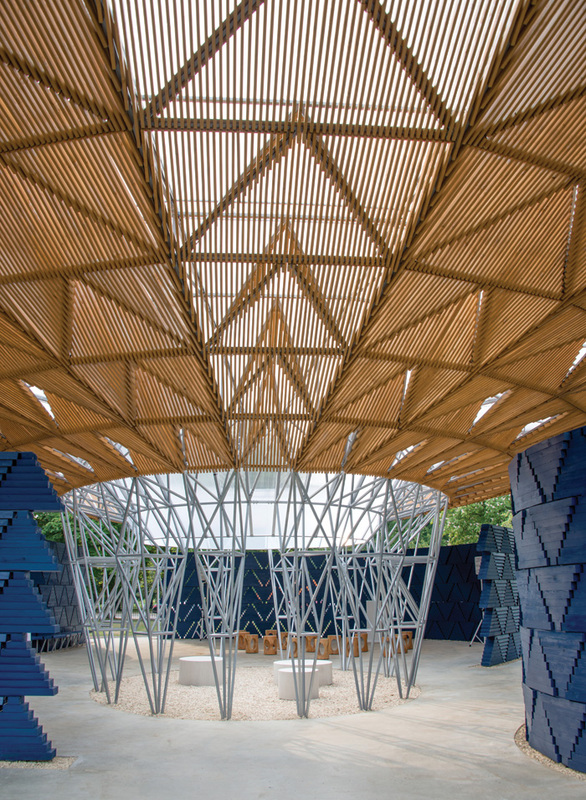 This year the pavilion has a slightly more serious agenda due to Kéré’s commitment to socially engaged architecture and ecological design. 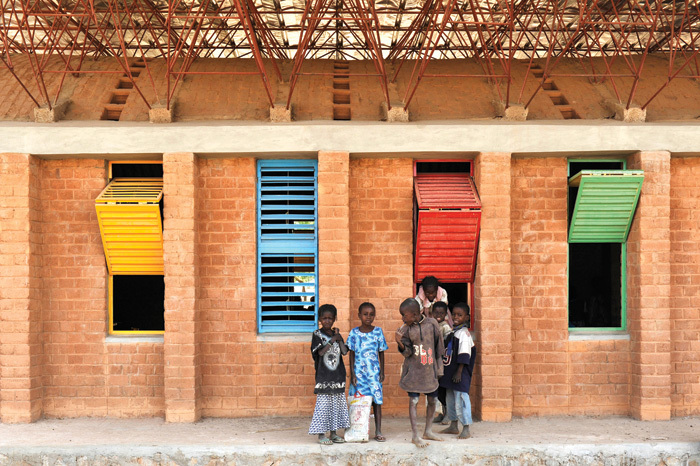 His is an architecture for the people — Kéré’s structures are humble, unpretentious and everyday but empowering too. ‘I create architecture to be used, architecture that has a purpose, to serve,’ he told Blueprint. 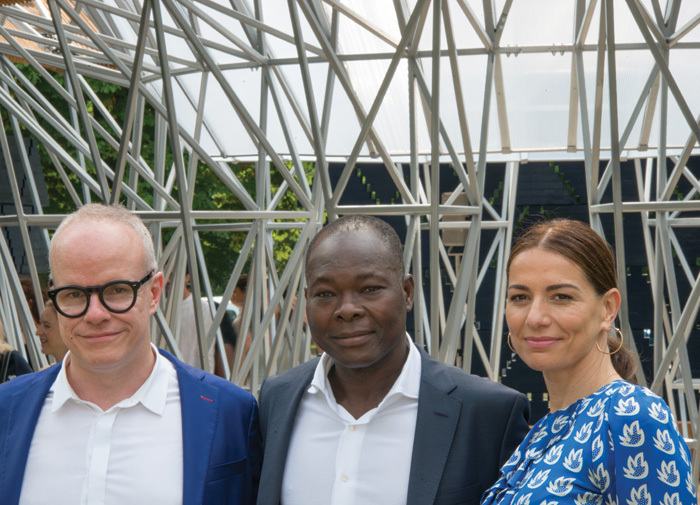 Hans Ulrich Obrist, artistic director of the Serpentine Galleries, was first introduced to Kéré’s work by the now-late German performance artist Christoph Schlingensief, who collaborated with Kéré on the Opera Village project in Laongo, Burkina Faso. 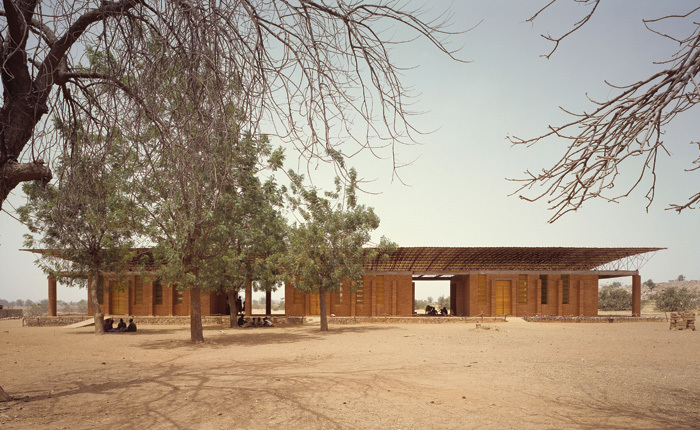 When plans for a performance centre fell through due to flooding damage to the site, Kéré and Schlingensief used an adaptable, cost-saving modular structure made out of local clay, wood and laterite stone to create classrooms, media labs, workshops and a medical centre for the surrounding community. 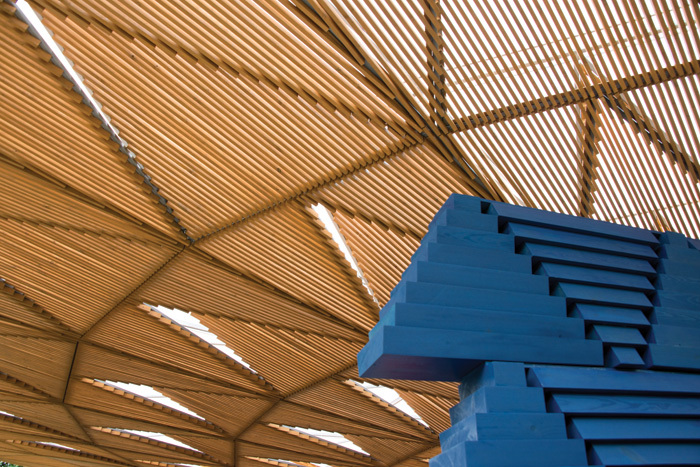 Touching lightly on the ground, the expansive roof of Kéré’s pavilion is formed of a lightweight steel structure, layered with some 400 triangular brise-soleil panels, made of thin, timber batons, fanning out towards the sky. The blue-stained screen system that wraps around the canopy comprises four walls, creating four entrances. 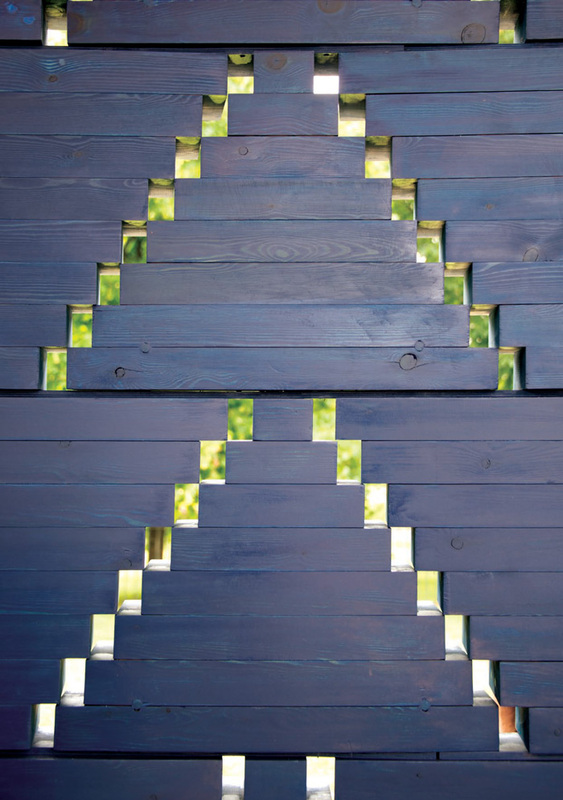 Designed to appear like an African textile, it consists of triangular modules, made of simple, stacked, 75 x 200mm timber members, tilted at different angles. The components were all prefabricated at Stage One’s workshop in North Yorkshire and fitted on site to a seven-week time frame. It’s remarkable then that detailing is so sharp and clean. 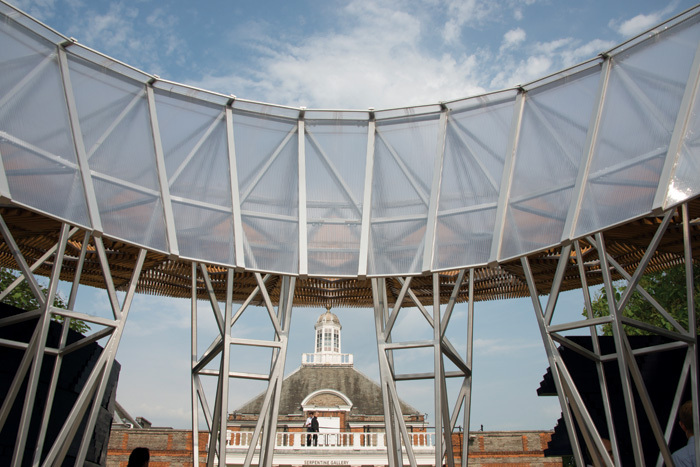 Small gaps between the modules allow light to filter into the pavilion space and create a sense of transparency. 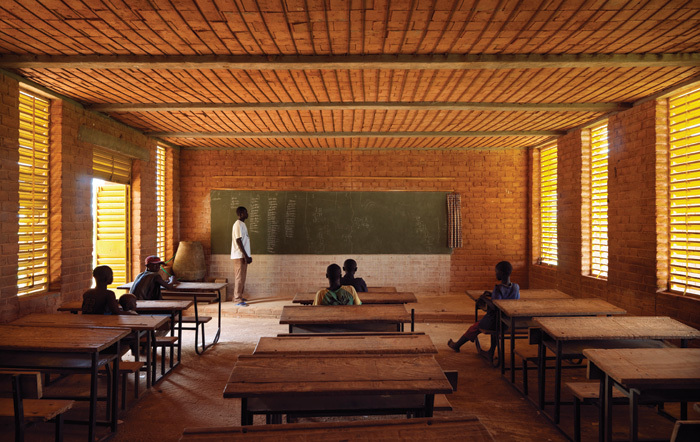 Much like at Gando primary school, the roof is detached from the walls, partly to let air flow freely but also to provide a connection to the outside. From inside, a slice of sky and greenery can be seen sandwiched between the canopy and the blue base. The roof is protected from water by a polycarbonate top layer, but opens at the centre to form an oval-shaped oculus and informal courtyard below. When it rains, it is hoped water will be funnelled through the heart of the structure 'like a waterfall'. 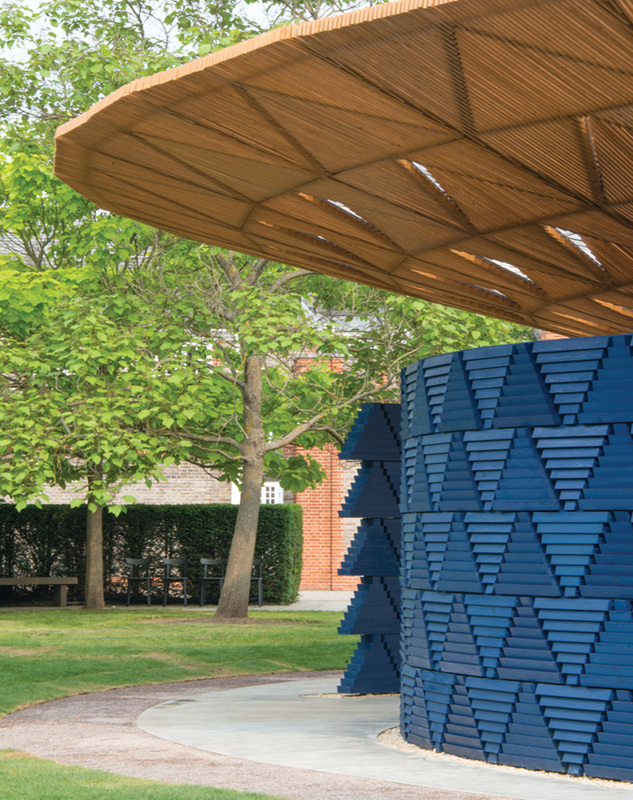 The pavilion sits on a platform of crisply poured concrete, with a hidden drainage system underneath to hold the water until it dissipates into the surrounding parkland. Says Kéré: ‘In London, you are spoiled, you have everything, and you don’t know that you have it. Water is a precious gift and I wanted to celebrate it here.’ A wooden slide for children provides a charming, playful counterpoint to the contemplative nature of the pavilion. ‘I wanted to create something for the community. I wanted parents to come with their kids, and while the kids are playing they can be sitting on the bench, listening through the openings while they have a coffee or a conversation. This pavilion is for everyone,’ Kéré says. Indeed this year the pavilion sought to open up a more meaningful debate and host a new series of weekly lunchtime talks called Radical Kitchen. Every Wednesday in July and August, a different London community group or campaign organisation meet in the pavilion to share their recipes for creating sustainable social change in the city, focusing on themes of community, care, solidarity, survival and resilience. Food is provided by Mazí Mas, a social enterprise that supports migrant and refugee women by giving them the support and skills they need to launch careers in the food industry. 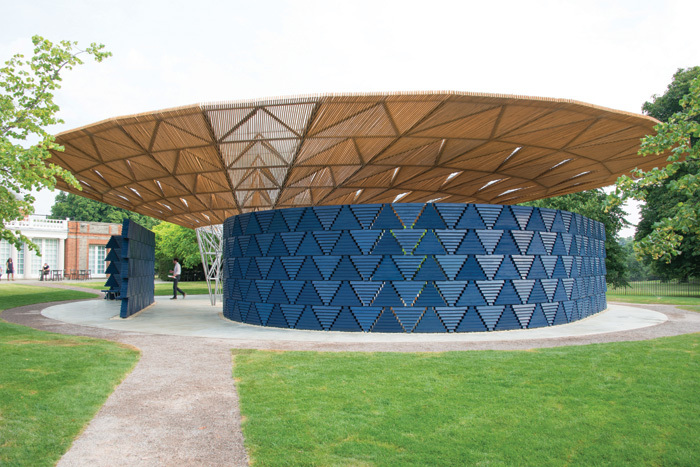 A beacon of blue, Kéré’s pavilion is an open platform for gathering, hope and debate. The blue is particularly symbolic for him, as it is the colour of the boubou, a traditional, kaftan-like robe worn by men in West Africa for special occasions. ‘[When you are a] young man and you have to meet the dream of your life, you wear the best clothes you have. You dress in blue and you’re shining as you’re approaching the house of your dream, and everyone knows that this is the guy; I cannot compete, I lost because this guy is so shiny,’ says Kéré. ‘I wanted to present myself, my architecture in blue. [When] you have a chance to do something like I have here you come in your best dress, you show your best side. 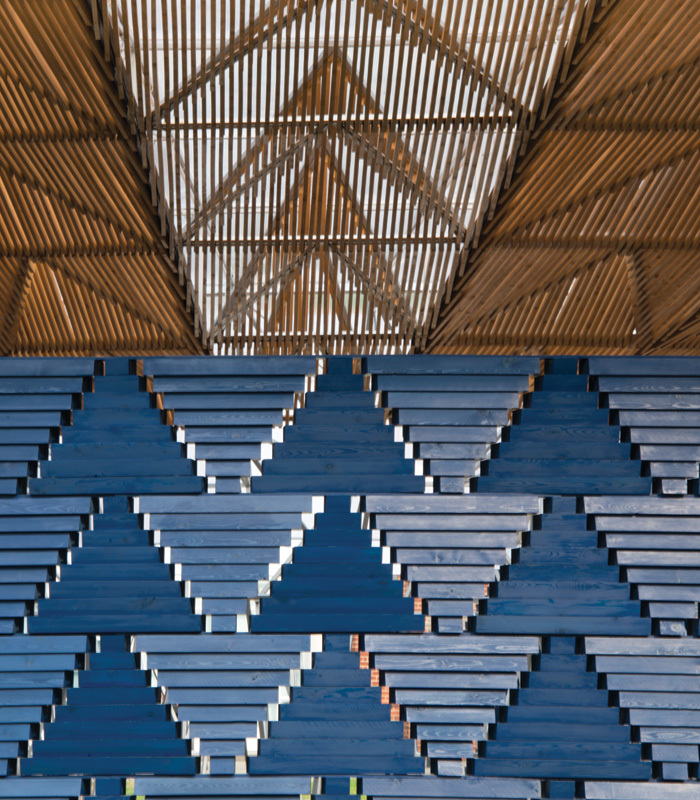 This is indigo blue.’ Kéré’s pavilion is indeed shining – and it’s showing up the ones that have gone before.